Trend of shopping online is becoming very popular and common in a world. It helps consumer to save time and we can have a desired product on one click at our doorstep. I'm very pleased to see trend of shopping online becoming famous and growing gradually nationwide. Many companies taking interest into the field and making shopping possible for the consumer. Today technology, clothing, beauty and grocery can be purchased online. I'm a fashion junkie and love shopping fashion and beauty accessories. I'm a single sister and don't have many opportunities to go out for shopping. Online shopping is a dream for me. A most amazing benefit of shopping online is we can compare prices and avail offers. We also can have many famous and amazing brands at our place those we cannot easily get in local markets near us. I recently discovered Vshaap. It's a site gathered many local and international brands at one place. Most amazingly its a first Pakistani site accepting payment via paypal. So if you live abroad and have relative in Pakistan you can send gifts easily with your account. They have huge range of branded clothing, footwear and handbags. Along ladies accessories they also has a range of men and kid accessories. 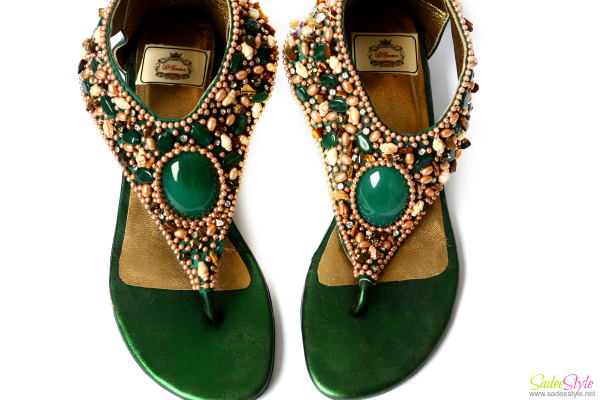 So today I have this Sea Green Stone Open Toe Flat Sandal by Dihaz galleria. It's a brand of Islamabad and only available at Vshaap.com. 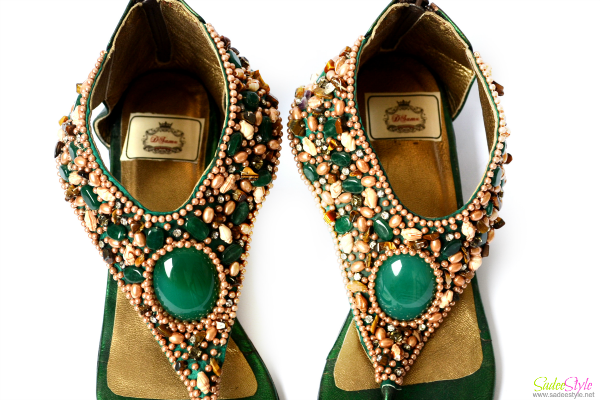 The charming sandal made with the finest material and studded with high quality stones and beads. Green is my favorite colour. It was priced 2,999 and available in size 38. Spring is finally here and we are heading to summer such flat sandal would look amazing with lawn wear. Overall I was a nice experience with Vshaap. I have received the confirmation call from the store to confirm my order. They offer free delivery nationwide on order above 1000 rupees and deliver product within 48 hours. Waiting for summer to wear that kind of shoes! Wow those look very pretty! Nice shoes .. grean stone is looking lovely on it.